Dunluce is a small community of houses in the environs of Dunluce Castle. There is very little in the way of services for the walker in the area, other than a small café catering for tourists visiting the Castle. 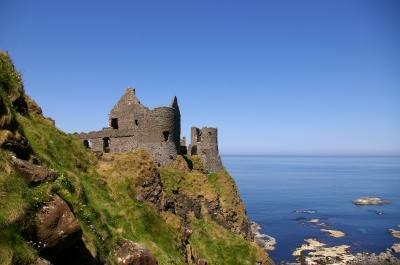 It is thought that Dunluce Castle was built by Richard de Burgh in the 14th Century. The oldest part of the castle is perched on a strategic height of rock overlooking the sea. Part of the castle ruins can be attributed to one stormy night in 1639, when part of the kitchen quarters collapsed into waves below. The Northern Ireland Environment Agency are the current caretakers of Dunluce Castle which now hosts over 70,000 visitors each year.